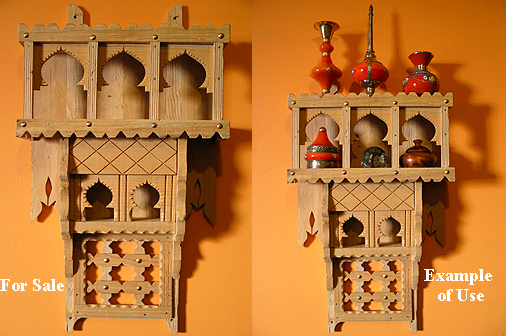 Beautifully handcrafted shelf from wood and precisely accented with Moorish designs. This is an excellent décor item. This wooden shelf is ideal for any area around your house or office. It is readily equipped so it would hang on the wall and can be displayed by its self or used as a display shelf for other small arts. It really is lovely and adds a warm and beautiful accent to the space in which it is displayed. The shelf to the left of the image is the one for sale as seen. The one to the right is to only give you an idea of what the shelf would look like if you display other arts on it. Shipping outside of the lower 48 US states will be calculated based on your shipping address and that is done after we receive your order, You will be notified with the adjustment before we process the order.